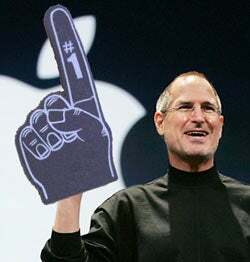 Apple's just confirmed the morning's news on them being the number one music retailer in the US. The stuff to take away: four billion songs sold, six million songs in the catalog, the most music sold in January and February out of any retailer. Hit the jump if you want to see Apple gloat for themselves. CUPERTINO, California—April 3, 2008—Apple® today announced that the iTunes® Store (www.itunes.com) surpassed Wal-Mart to become the number one music retailer in the US, based on the latest data from the NPD Group*. With over 50 million customers, iTunes has sold over four billion songs and features the world's largest music catalog of over six million songs. "We launched iTunes less than five years ago, and it has now become the number one music retailer in the world," said Eddy Cue, Apple's vice president of iTunes. "We are thrilled, and would like to thank all of our customers for helping us reach this incredible milestone." *Based on data from market research firm the NPD Group's MusicWatch survey that captures consumer reported past week unit purchases and counts one CD representing 12 tracks, excluding wireless transactions. The iTunes Store became the largest music retailer in the US based on the amount of music sold during January and February 2008.